Just in time for this weekend’s TwitchCon, Razer debuts a pair of new peripherals: the compact Serien X microphone and the Kiyo, a ring light-sporting webcam that’s sure to be the next must-have streaming accessory. One of the keys to making a livestream really pop is getting proper lighting on the face of the player. With most streamers situated in front of a desk of some sort, there’s not a lot of room for fancy lighting solutions. The Kiyo addresses this issue by surrounding the lens with a ring light with 12 different levels of illumination, adjustable by rotating its outer edge. Here’s a snap I took with the Kiyo. The unit is sitting on my desk on a tripod, maybe a foot from my face. I’ve got the blinds open, allowing a little natural light in, but otherwise my office is pretty dark. It makes a huge difference. It’s an idea so simple it’s amazing no one else has done it yet. The image blows my Logitech C922—the current webcam standard—completely out of the water. Avialable today for $99.99, the Kiyo is capable of shooting 1920 x 1080 at 30 frames per second or 1280 x 720 at 60 frames per second. It’s compact, portable and folds up for easy travel and storage. It’s all sorts of perfect. Just as innovative is the Seiren X, a compact desktop microphone that features the world’s first built-in shock mount, to help reduce the vibrations common with desk-based mics. Standing at only six inches tall, it slides between the streamer and the Kiyo webcam without obscuring the shot. The Seiren X is a condenser mic that boasts a very cool super cardiod pickup pattern that’s really effective at picking up the broadcaster and not much else. I’ve used it in a conference call with the call audio coming through my desktop speakers behind it, and no one on the call could hear it. Very impressive, and kind of cute. 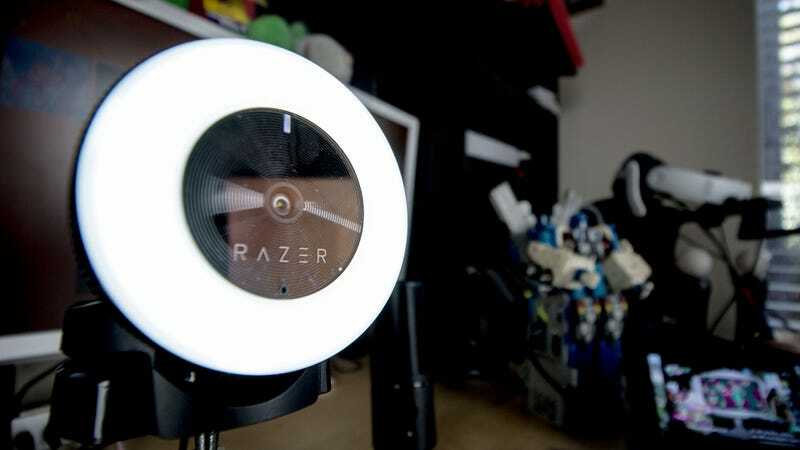 Razer’s tried to capture the streaming crowd before with its original Seiren microphone and its Stargazer webcam, but that pair didn’t offer much more functionality than what was already out there. With the innovation and utility of the Kiyo and Seiren X, it might just be Razer’s time.